I love cookies. They are portion-controlled bits of food hugs. Even the word cookie is derived from the Dutch word kwoekjes, meaning “little cake” (anglicized to “cookie” by the early 1700s). Sharing cookies is easy and so fulfilling…it plays to the food is love caring part of my soul. Cakes and cupcakes are good, don’t get me wrong, but there is such a variety of flavors and textures, mix-ins and toppings that cookies can have so they don’t get monotonous. And the best thing of all is that making cookies and eating cookies can be a shared experience. Cookies don’t have to be fancy to be wonderful, and home baked cookies, made with wholesome ingredients and baked with a special someone else…those are the best. There is a zen-like quality to the magic that is baking…you mix ingredients, weighing and measuring carefully, you follow the recipe step-by-step, you get in the zone so as not to mess up. Distractions or inattention can be small and inconsequential or they can be disastrous (did I put in the baking powder? Yes? No? I’ll add more just in case…Uh oh…). When I bake by myself, I’m doing it to produce something wonderful from disparate ingredients (that fulfills my creative side) and to give the people I love a food hug (that fulfills my nurturing side). But cooking with other people, especially with one or both of my daughters…now that’s a special time unto itself. I’ve baked with my girls from the time they were very young. They’d get to stir the batter or help measure out flour, and then get to lick the spoon at the end as a treat (this of course was before the days when raw eggs were demonized). Cookies were especially fun because there were so many recipes from which to choose. The scientist in me loved to teach them about the math of cooking (“Look, four 1/4 cups is the same as one 1 cup. Neat, huh? !”), and the mom in me enjoyed watching them stir, scoop, bake, then share what they made. Yes there were mishaps, and yes I still tried to control the mess as much as I could, but the time we spent together was magic unto itself. In a large saucepan melt butter and the 1/2 cup chocolate pieces over low heat. Remove from heat. Stir in coffee crystals; cool 5 minutes. Stir in sugars, eggs, and vanilla. 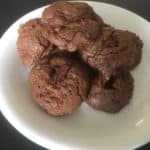 In a medium mixing bowl combine flour, cocoa powder, baking powder, and salt. Stir into coffee mixture. Stir in the 1 cup chocolate pieces. Drop dough by rounded tablespoons** onto lightly greased cookie sheets. Bake in a 350ºF oven 10-12 minutes. Let cool 1 minute before removing from sheet. (in the picture below) and make 60 mounds, but the original recipe said their yield was 30 cookies leading me to believe that they made bigger mounds. I find that the 1 Tbsp size is plenty because these cookies are rich. I'll leave it to you to decide which way you'll go, but don't say I didn't warn you! What I like to do is the bake some/freeze some method…I’ll bake just enough for immediate consumption (usually 1-2 cookies per person), then freeze the rest of the mounds on a wax-paper lined cookie sheet. Once they’re frozen, store them in a ziplock-type bag. When you want wonderful warm chocolate goodness, take out however many you want and bake them at 325ºF for 13-16 minutes (there’s no need to defrost them first). Yum! p.s. to my almost-graduate…Happy Birthday! Enjoy your tea and scones, and I’ll do the same on the other coast.